at a very accurately defined height. For these measurements conventional laser triangulation sensors required a complicated system setup and their complex adjustment incurred costs. The wave motion of the liquid that occurred interrupted the measurement signal which could not then be used for further evaluation. To compensate these shortcomings, a confocal sensor of the Series optoNCDT2400 was employed. 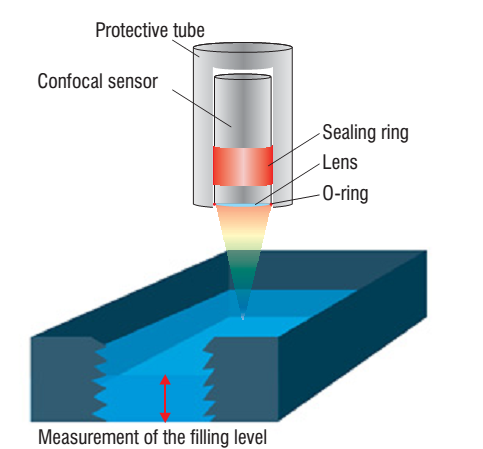 By means of the confocal principle this system measures to the directly reflecting surface of the solvent. The explosive vapors are kept away from the sensor since it is inserted into a conduit with a sealing ring and an O-ring seals the optical system. In addition the conduit is constantly heated externally to prevent condensation forming on the optical system. This measurement arrangement ensures that due to an exactly defined dipping depth the individual components conform to the defined quality criteria, such as for example the shelf-life or safety under short-circuit conditions.